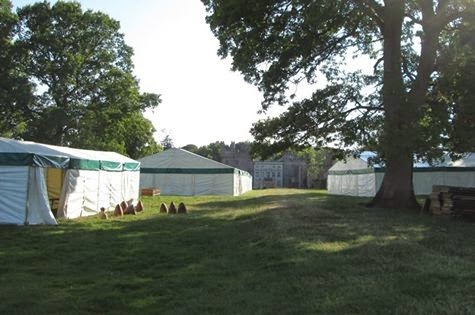 Blisteringly hot Cumbria, marquees up stand mostly set up. Excellent sales for me, Hooray! A couple of days before the next event - POTFEST in the PENS . . .
Where did my post go to??? Having totally lost the blog I published in the week I have to redo. After a gap of two years I now find myself doing 2 blogs in a week. As if I don't have enough to do at this time of year. July was the first firing of the year, pots made from March onwards after recovery from a nasty hernia repair. Kiln packing, getting loads of pots in. The results were pretty good, over 200 pieces out and only 4 losses, the big teapot went to America from a commission and cups and saucers had been commissioned by Valentine Clays my long term clay supplier. Pots to look out for . . .
Another successful firing. Over 200 pieces came from the kiln and only 3 losses this time. Plenty of good looking plates from this kiln. After unpacking it all it was time to put together some sets. Having got the kiln packed and lit on Saturday morning at 6.45am all seemed well until I heard the dreaded POP! of an explosion within the kiln. Something I haven't heard for about 8 years. I raked remnants of a pot from the burner port, lost at least 20 minutes in the firing time and can see there will be a few losses from this kiln. Hoping those losses are just what I can see through the spy-holes. Cursing myself for risking a couple of pieces which may not have been totally dried out but that's the life of a potter I suppose. Resulting mayhem may be posted in the week. At first it didn't appear too bad but if you look closely there a little dots on the kiln shelves they are bits of exploded pot. that had been a16" diameter charger, disintegrated. All the plates and platters were ruined about 25% of the pots were ok and 20% rescued with a chisel and carburundum stone. Well after two superb kilns a complete and utter disaster! Onto the rest of life. Someone dropped off some mature clumps of ornamental grasses this morning so I had to get them a home promptly. Fortunately this border was new and empty. Now I have just to find the time to gravel it at some stage. At least the sun is driving me into the cool of the studio more often now, so that's a good thing. Yes they do look like a set of 'Gonks', do you remember them? More wood arrived today, as has the sun. and customers from the canal at last. Possibly summer will arrive this year after all. I am doing an hour in the garden an hour in the studio and so on now in a bid to keep a balance on things. I am determined to make it work, problem is you forget that customers take time to serve and friends call round. But it all makes for enoyable times. I really don't know when I will get this lot logged up and stored. A quite enjoyable day at Loughborough. A Potters Market organised by David and Louise Salbury as part of British Ceramics Week and the Craft & Design Month sponsored by the Magazine Craft & Design. It was a damn cold day but I had decent sales and hope to have some new visitors to the studio from there. Unfortunately the battery on my camera ran out after one photo. I was good to see old friends, and yes we are all getting older. Market stands provided cover but not shelter from the cold breeze. Raising the boards to increase the depth of the last veg plot, more compost and soil to be dug in and still waiting for seeds to start showing in the green house. It has been just too cold for germination. At least some of the plant splitting has been successful. I am getting plenty of pots made and the rack for kiln firing is filling up well. Yes the seats in the garden are essential! Problem is having divided up the plants I know I have to plant them at some stage.That means more work out of the studio. Good or bad thing? Well a few days grafting in the studio and the weather is getting a tiny bit warmer more gardening tasks have been tackled and I am hoping the honeysuckle I trained around the hazel frame will thicken and make sitting atop the septic tank in the sun for breakfast a more pleasurable experience than it sounds. There really is no odour from the working tanks. Four fat Blackbirds nesting in one of the conifers in the garden. There are a other blackbirds nest in the garden and I discovered the nest of a pair of Yellow Wagtails in the top of an empty propane bottle at the side of the studio. Teapots glazed yesterday and medium plates thrown, I have to get my head down and work through the list of stock needed for the year. With all the wet weather drying times are long but I just know that as soon as it warms up I will be chasing to keep up with catching pots at the right condition for handling and glazing. Plates low down turned awaiting glazing, more plates to turn and teapots lids to hole and fit.